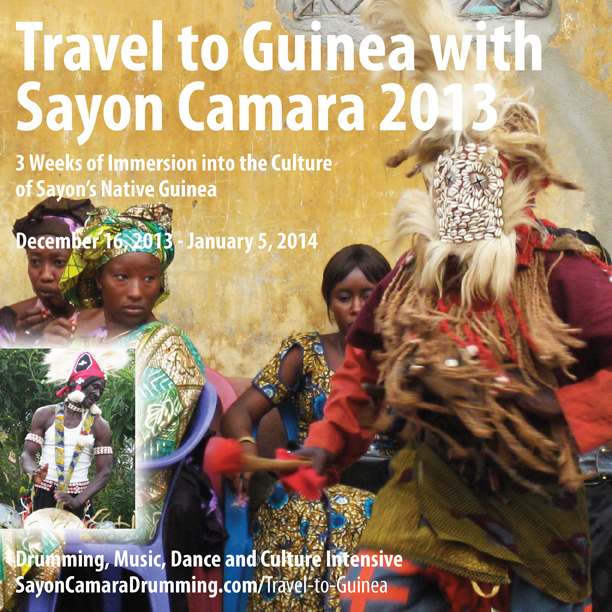 Travel to Guinea with Sayon! Find out more and get started here! Yes! Sayon is part of the Making Music exhibit up at the Montshire right now for those who missed the exhibit the first time around. You’ll feel like you’re sitting in class with him! Making Music is a hands-on experience with all kinds of instruments. We learned a lot, had fun and highly recommend it for all ages. The museum is open daily, 10am to 5pm, except for Thanksgiving and Christmas and is located at One Montshire Road, Norwich VT 05055. Happy holidays to all from Guinea. Abdoulaye was so kind to me when I was out in Seattle last year. I would like to extend his kindness by letting others know of this opportunity to help Abdoulaye’s family take him home to Guinea. A unique class that brings the art forms of Sayon’s culture together. Journey to an African village with Sayon Camara of Guinea and his wife Lev in a workshop that engages participants in the drumming, music, song, story, traditional language and dance from the place where Sayon delighted in his childhood and served as djembefola (one who plays the djembe drum). All ages and skill levels welcome. No experience necessary. We will work at the level of those in the group. Plan to experience joy and the music and dance traditions of a very different culture. 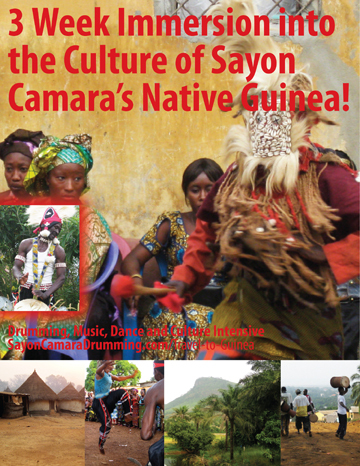 Village music, song and dance is simple and Sayon is a patient and skillful teacher. This is under the second Specialty Classes category. Email SayonCamaraDrumming@gmail.com or call 802 779 4914. Don’t miss this one night only workshop with Sayon in Lexington KY! Details here. All the information you need to get you started! Click here! Woohoo. This is GREAT news. The application process was challenging and we are sooo delighted to have been accepted. This means Sayon Camara Drumming has received the endorsement from the Vermont Arts Council to provide residencies for schools, in Vermont and elsewhere. To find out more go to our Residencies page or directly to Sayon’s listing at the Vermont Arts Council Directory.